OMAHA, Neb. (KMTV) — For the last 27 years, Jim Homan has strolled the sidelines as the Omaha Gross Catholic girls' soccer coach. He's led the Cougars to three state tournaments and was able to coach his two daughters, Alex and Kenzie, who now play together at Morningside College. This spring, however, might stand out more than any of the others. His wife of nearly 29 years, Darci, isn't in the stands to cheer the team on. "She would come to every game and be loud and boisterous," said Jim. "That's kind of her thing. There's a hole there that she's not here but she asks about the game as soon as I get home." Three years ago, Darci was diagnosed with non-Hodgkin's lymphoma. 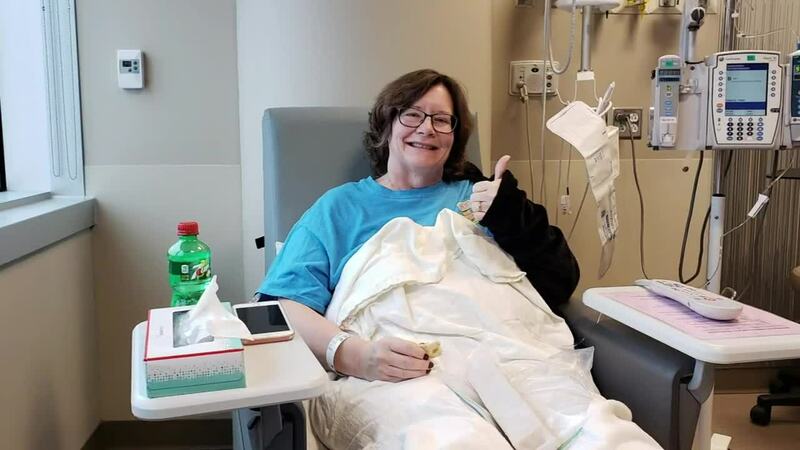 After she beat it twice with several rounds of chemo and a stem cell transplant, the Homans received bad news yet against last November: the cancer had come back. "It was a big shock," Jim said. "It's always in the back of your head: will it come back? Especially for my wife, you know, she worries about that as I think that's typical with anyone that's experienced cancer." "Darci is one of the best people I've ever met," said senior defender Callie Billings. "She's so kind, so nice. You'll never see her give up on anything. She's very strong. The first time I had heard about what happened to her it broke my heart because I'd become very close with her and her family. And seeing someone who's such a good person and always upbeat and positive having to struggle with something like this was rough to see." "She's immediately a 2nd mom to me," said team manager Mackenna Sidzyik. "She's always looking out for everyone. Any time you need something, she's right there. She's either yelling for you in the stands at a basketball game or a soccer game or she's right there if you need to cry. Any emotion you can let out to her." At the first pep rally this year, the girls' soccer team surprised Homan by wearing purple and green warmup shirts that say 'Team Darci'. "I just started crying and it was amazing," Jim said. "Right after the pep rally, we took her a shirt. She was in the hospital still and she teared up. She was very emotional about it because she loves these girls. The support we've received from Gross Catholic High School, from our students, from the faculty and staff, it's humbling and I'm so grateful. Grateful to be here and grateful that Darci has people pulling for her." "We knew that our season was going to be dedicated to her because of everything she's been through with us and everything she's given to us," said Sidzyik. While Jim did not think Darci was well enough to be interviewed for this story, he does believe she will reach her goal of cheering on his soccer teams once again. "It's gonna happen OK?" said Jim. "And it's going to be amazing because she loves the school as much as I do. She wants to be here so I really look forward to that day." "I'd do anything to be able to see her in the stands again," Sidzyik said. And while Gross Catholic currently has a winning record, Coach Homan isn't shy when he thinks his team needs extra motivation. "Darci's a fighter OK?" Jim said. "You're Team Darci and that means you fight on no matter what. No matter what the adversity, you keep going." "Even though we're on the field going through our game and having struggles during our game, we just think of Darci," said sophomore forward Sydney Herren. "Because there's nothing during the game that could be harder than what Darci's going through." "She's not in it alone," said Billings. "We're all here for her. We know she's going to get past it. She's done it multiple times before. She can get past it this time. The team's behind her. The whole school's behind her. Everyone's got her back." A fundraiser will be held for Darci on Saturday May 4th at St. Leo's Catholic Church (1920 N. 102nd Street) in Omaha from 6:30 to 9:30 p.m. There will be a freewill donation taco bar and a raffle.